* Replaceable 2x AAA Batteries included for thousands of readings. Do you have an online guide to work this thermometer? Yes, We have a 16 page instruction PDF booklet that is on our VIP section of the website that you have permanent access to. It comes with the all you need to work the thermometer with bonus hints and tips. The guide is also printed in the package with your warranty card too. How do I take a proper reading of the forehead using this thermometer? You need to start the reading at the side of the forehead (temporal) and continue to touch and then move across the forehead before releasing the HEAD button. 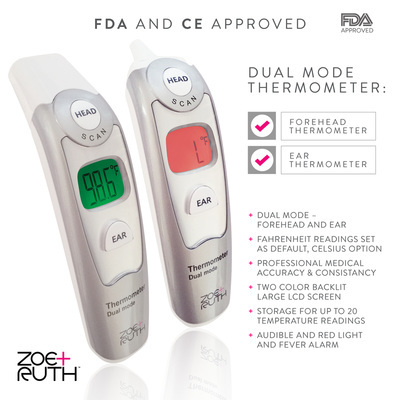 You will hear a soft clicking sound while the thermometer is being moved across the forehead. If you are not touching the forehead the reading can be inaccurate. Do not hold the thermometer at a distance from the forehead. Yes, all our products are CE and FDA approved and we have the 510k (class 2) certificate associated with this device. How do you change the unit from Fahrenheit from Celsius? 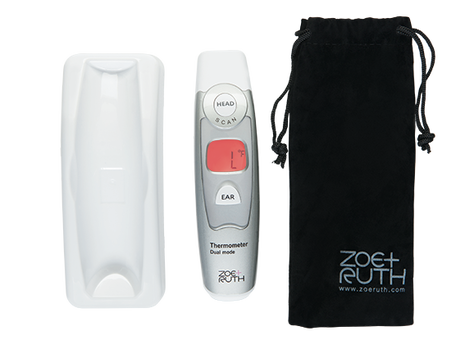 We had the Zoe+Ruth model ZRT201+ set to Fahrenheit for the US market but you can easily change it to Celsius if you prefer. Make sure the thermometer is off and then hold the EAR button for about 6-9 seconds. The screen will display "---" with an “M” at the bottom right. Keep holding the button until you see the Celsius (C) and Fahrenheit (F) temperature unit on the screen. Let go of the EAR button the C/F will then start blinking. Press the EAR button again with 5 seconds to set the unit of choice. What is the reason for sometimes having a low temperature reading? The sensor will need cleaning at times. The delicate sensor is extremely sensitive to dirt and oil. The surface should be clean for all temperature readings to get an accurate result. If it does contain dirt or grime please use a Q-tip soaked with alchohol until the sensor is clean. Wait 10-15 minutes for the alcohol to evaporate first before using again. Is there a difference in ear and forehead readings? There will always be slight variations in body temperatures when taken from different parts of the body. Temperatures taken in the ear for example are usually higher than temperatures taken on the forehead, usually from 0.5°F to 1°F higher. Does it come with batteries and what type of batteries does this thermometer take? Yes this unit comes with complimentary batteries to start temperature measurement straight away, It comes with a little plastic tab that keeps the batteries brand new but you need to remove this tab for the unit to work. This thermometer takes 2 AAA batteries. Not the AA type - please check the side of the battery. On the unit there is a diagram to show which way they go back into the unit too. Can this thermometer be used to measure Basal Body Temperature (BBT)? Yes it can. 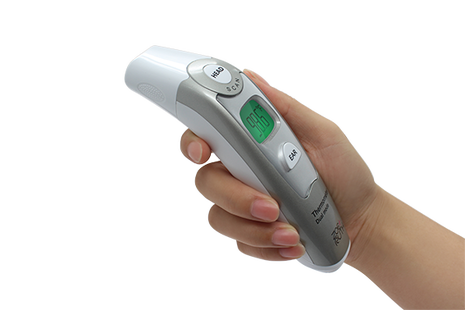 This thermometer can be used as a tool to help record your temperature regarding ovulation. This means taking your temperature every morning and then charting these temperatures with a Basal body chart. One you can download for free on our website here. BBT thermometers need to be at accurate to the tenth degree. This thermometer also has a 20 memory recall function to help remember your temperature settings.